I feel sorry for author Samantha Shannon. Someone did her a disservice by calling her ‘the next J.K. Rowling'. And then NPR took those words and titled their article “Could This Be The Next Harry Potter? Maybe!” And now, people are mad—really mad—that this book is NOTHING like Harry Potter. And I can’t find anyone using the active voice to attribute the comparison; NPR says “Samantha Shannon is being touted as the new J.K. Rowling”, but who—WHO—started this? 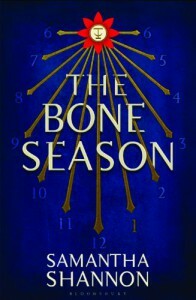 If anything, I view Bone Season as a mix of Hunger Games and Twilight, with a sprinkling of Ender’s Game. That still sounds decent, right? Bone Season offers us futuristic despotism, vampire-containing love triangles (yes, I’m serious), and mystic survivalism. I don’t remember any of that in Harry Potter. And here’s the thing: Harry Potter was fun. Bone Season, not so much. Potter fans that come with NPR’s article in hand will be sorely disappointed. The writing is not what I would expect from an Oxford University MFA graduate. However, Ms. Shannon was fortunate to have an internship with one of London’s premier agents and she signed a fantastic seven-book, six-figure deal. Congratulations to Ms. Shannon; that’s awesome. I give Ms. Shannon credit for one thing: she sets up a fantastic playground. And I can tell she had a lot of fun playing in the world she created, but it leaves people confused. Maybe I’m looking at this wrong, but I don’t believe readers should have to flip to a glossary or look at a chart to fully understand the action transpiring. And here’s the kicker, when you strip away the cleverly invented terminology, the action lies flat. If you do some adlibbing and replace the new terminology with common nouns, you are left with a typical Young Adult sounding narrative; the syllable count is low and the narrative clichéd. I don’t fully buy into this newly created world. A lot of new terms are thrown at the reader quickly, but I don’t recall a proper explanation. I don’t see many gramophones in use today, so how did a shanty town in London come about them? When did public hangings become commonplace? And when did the revival of the word ‘ain’t’ take place? And what is with the perfunctory use of italization? Both Night Film and Bone Season came out on the same day and both books seem to randomly, commonly italize phrases. Is this a new literary tool to create distraction?